Sophie is a journalism arts student with a passion for all things culture. She majors in psychology and sociology, and is fascinated by people’s stories and how they make sense of the world. She is well-traveled, occasionally suffering from wanderlust and is interested in music, film, literature, science and technology, and arts. She learns fast, works hard, and is never afraid to grab hold of a story and get her hands dirty. She hopes to combine her broad interests in to a career that will take her around the world when she graduates in 2014. Video Mini-Documentary – Australia and Informatics Education: where to next? Australia and informatics education: where to next? As the IOI 2013 comes to a close, industry experts are drawing attention to how Australian school students engage in informatics in the national curriculum. The Queensland Informatics Outreach Program aims to attract more schools to teaching informatics by demonstrating the usefulness of informatics in strategy and problem solving. Informatics competitions may not be as enthralling to watch as sporting events, so how do you draw a crowd when the main event is intensive performance from behind a computer screen? Eljakim Schrijvers of the Netherlands sure knows how to talk mathematics and keep audiences entertained. 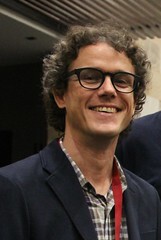 Sophie Lester found out about Associate Professor Benjamin Burton’s role in IOI 2013.